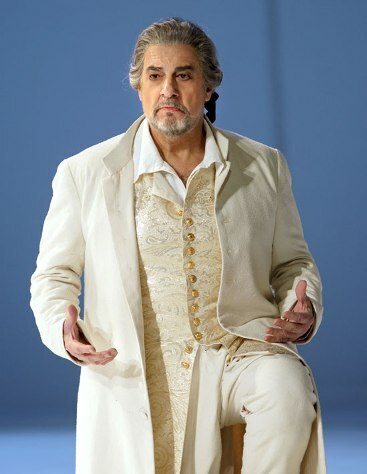 More than four decades into his career, Plácido Domingo has nothing left to prove. But the Spanish tenor can't resist setting himself new challenges. At a time when he might easily rest on his laurels and sing the high Romantic repertoire for which he's always been famous, he has instead moved to contemporary opera, the baritone title role in Verdi's Simon Boccanegra, and, in the case of this new DVD, Handel. 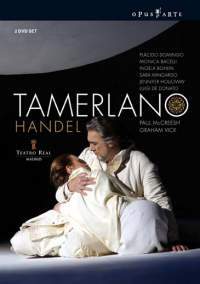 The character of Bajazet in Tamerlano shares something vital with Boccanegra, in fact: the intense love of a father for his daughter. That's something which Domingo connects with absolutely, conveying all the anguish and worry of the senior parent, a man who has enjoyed power and yet is powerless because of the events of the opera. Vocally, he's not particularly well suited to the music, looking and sounding tense during long coloratura passages, and he does sound his age at times, even if his vocal presence is undimmed. Yet it has to be said that the magnetism of his performance is in another league to that of the rest of the cast, all of whom are baroque specialists. One can't ignore Domingo when he's onstage, and although he's never going to conquer this repertoire absolutely, the expressivity of his singing is as magical as it ever was. Though he seems uneasy in his opening aria, 'Vo' dar pace a un alma altiera', he grows in vigour as the opera proceeds, and his final scene is a tour de force of dramatic pathos. Graham Vick's production, here filmed at the Teatro Real in Madrid (Domingo's hometown), is stunningly beautiful in Richard Hudson's stylised sets. The predominant colour is white, with the stage dominated by a large foot positioned over a white globe, but the appearance of a big blue elephant centrestage at one point and some baby ones at the back at another gives strong accents. This provides a powerful mixture of the classical with the exotic. Vick uses the stage well, contrasting the wide open space of the full stage for the public scenes with other moments where the singers just sit on the edge of the orchestra pit and sing intimately to themselves. A sliding wall with a circular opening gives a clever framing device, and there are some lavish costume designs, for Domingo in particular. I'm less keen on the presentation of the two travesti roles, however. Tamerlano especially is presented as a ridiculous character with excessive gestures which pass for pseudo-choreography, and while I appreciate that this – combined with a camp costume – is a comment on the character's status as a leader, I don't think it really does the production any favours. Admittedly, I didn't warm to Monica Bacelli's singing in the role, with her unfocussed tone and lack of imagination towards text and phrasing not making enough impact. That's in enormous contrast to Sara Mingardo's extraordinary performance as Andronico. With remarkably little in the way of theatrical gestures, she makes an eight-minute aria like 'Benché mi sprezzi' a mesmerising experience through strong vocal articulation and a richness of tone. Ingela Bohlin is more than acceptable as Asteria, but efficient rather than special: her light soprano has nothing memorable to offer in this performance, and she's inevitably left in the shadow of Domingo's much larger instrument in their scenes together, albeit deliberately in some respects. Luigi De Donato is similarly lightweight as Leone, but Jennifer Holloway is superb as Irene, giving a complete performance in every way. Though I have these small vocal reservations, however, the musical performance overall is outstanding. The hero of the occasion is Paul McCreesh, who coaxes such idiomatic playing from the Madrid Symphony Orchestra that it's easy to forget that they're not specialists in the repertoire. By giving the strings clear directions as to different performance techniques and defining fast but manageable tempi, McCreesh makes the four hours of the opera fly by in a flash. Opus Arte's packaging is excellent, and the interview with McCreesh is informative, but it's worth mentioning that the English subtitles are very poor – apparently deriving from a very old translation if the following is anything to go by: 'Asteria angry, believes me false, and throws me in a fury from her bosom / And swear all penalty that's due to falsehood. / Can a poor breast bear a worse scorn of fate?' This isn't very helpful when trying to engage with the plot during the recitatives, which is a shame. However, the quality of the surround sound is brilliantly clear, and this is a highly respectable recording, indeed a vital purchase for Domingo fanatics, especially by way of preview for his appearance in the production when it comes to Covent Garden next season.